Eliminate STAAR deficiencies with Fast Focus. It's fully compatible with Countdown and packs a powerful punch! The data is in and you've identified your students' deficiencies. Now what? It's time to focus on those trouble spots with Fast Focus ! Fast Focus delivers over 150 half-page problem sets that focus on specific STAAR standards. Most problem sets can be completed in less than seven minutes, so addressing trouble spots is easier than ever! Does your school provide its students STAAR tutorials? Fast Focus is the perfect resource for any math STAAR tutorial program! And with over 75 pages, there ís more than enough to be used in both the classroom and tutorial setting. Fast Focus is the perfect complement to Countdown to the Math STAAR, but it also works in conjunction with Lone Star Daily Rigor and Numeracy Power-Up. Like all our products, Fast Focus is easy to implement, straightforward, and affordable! We hope your school will try a fresh approach to STAAR prep this year with MathWarm-Ups.com's complete line of products written exclusively for Texans by Texans! Free Trials for Fast Focus. To see Spanish prices, click on the grade you want below and then use the drop down option for language. The Countdown Complete 2015 includes the 2015 versions Countdown to the Math and the Fast Focus in English and Spanish, 4 products combined in a complete set! Q: Is this Fast Focus new, or is it the same Fast Focus from previous years? A: Almost 100% of the problems are new--written specifically for the STAAR. Q: Is Fast Focus TEKS based? A: Yes. It's 100% TEKS-based. Q: Do I have to own Countdown to the Math STAAR for Fast Focus to work? A: No. Fast Focus can work as a stand-alone STAAR prep. Q: How is Fast Focus different from other STAAR prep books? A: Fast Focus gives you the same high-quality STAAR format problems as other programs, but we simply condense graphics and eliminate superfluous space. We know from experience that copy paper at many schools is limited. We strive to put the maximum amount of math on the minimum amount of space. You'll find this to be true with all of our products at MathWarm-Ups.com. Q: Why is each page of Fast Focus divided into two parts? A: The half-page format of Fast Focus is intended to give you flexibility. Depending on the situation, you may wish to assign half of a page or an entire page. You may want to work one half in class and the other half for homework. You may want to work the left half orally with your class (modeling and explaining strategies) and then assign the right half as independent work. There are many possibilities! Q: Does Fast Focus start easy and get harder later? A: No. Fast Focus is full-level STAAR difficulty from start to finish. That's why we suggest you use Fast Focus after the winter break. 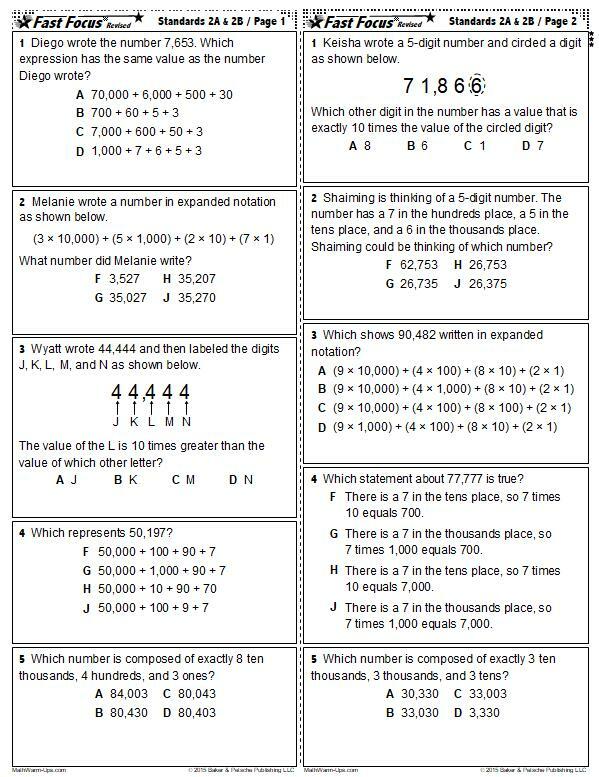 Our MathWarm-Up.com series, Lone Star Daily Rigor, starts easy and becomes progressively harder. For more for information about Lone Star Daily Rigor. Q: Is Fast Focus available in Spanish?